2015 I WRAPS I 41 W ith vehicle wraps exploding in popular ity, shops and individuals of all sorts are wondering if they can or should offer vehicle wraps. Some individuals are already great at installing, or have skills that would allow them to quickly learn. Small and large print shops, and automotive restylers are increasingly fielding requests for wrap jobs from loyal clients—but they don't want to spend (or borrow) the money needed to hire a graphic designer and/or buy the expensive computer and printing gear necessary to produce vehicle wraps. Even shops already in the graphics business are often hesitant to offer wraps because they know that producing consistently successful wraps is not as simple as having a graphic designer and a wide-format printer. Producing wraps is a specialty, and requires specific expertise in messaging, designing and printing effective advertising for vehicles. For these shops there are solutions that will allow access to the wraps market without having to make the up-front investment. 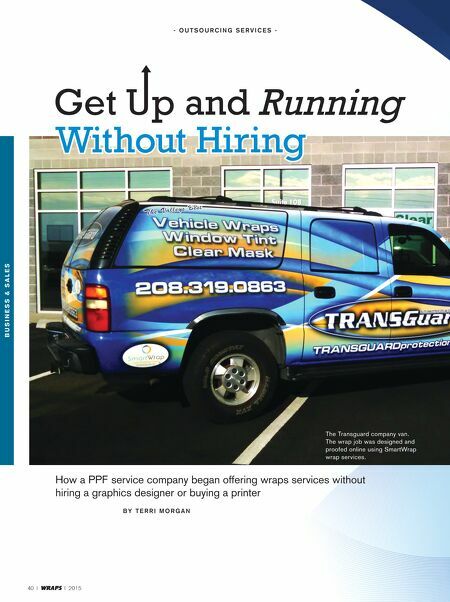 Case in Point Transguard Inc. is a shop based in Boise, Idaho, that for years sold and installed only paint protection film and window tint services. Then Transguard's largest wholesale client, a local auto dealership, went in-house with its own paint- protection system. Transguard's owner, Scott Cluff, quickly saw that the firm had lost a sizeable chunk of its annual revenue. "We realized suddenly how true it is that you really shouldn't have too many of your eggs in one basket," says Cluff. "And with a limited number of dealerships in our area, we needed more than a replacement account—we needed an additional revenue stream." 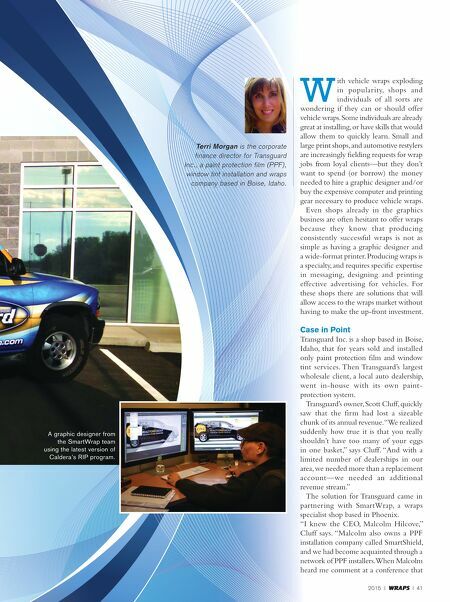 The solution for Transguard came in partnering with SmartWrap, a wraps specialist shop based in Phoenix. "I knew the CEO, Malcolm Hilcove," Cluff says. "Malcolm also owns a PPF installation company called SmartShield, and we had become acquainted through a network of PPF installers. When Malcolm heard me comment at a conference that Terri Morgan is the corporate finance director for Transguard Inc., a paint protection film (PPF), window tint installation and wraps company based in Boise, Idaho. A graphic designer from the SmartWrap team using the latest version of Caldera's RIP program.